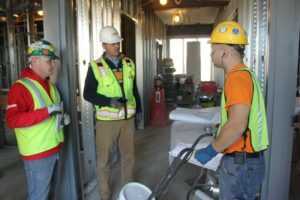 Maintaining the safety of workers on a six-story job that spans 60,000 square feet is a daunting task, and a concern for not only the construction firm but also its insurer. A recently announced collaboration between Travelers, Gilbane, a large contractor working in the U.S. and Canada, and Triax Technologies aims to explore whether wearable devices can improve safety on construction sites. 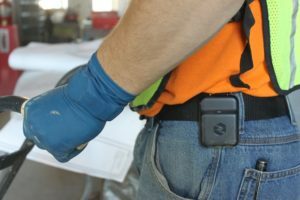 More than 130 employees will use the Spot-r Clip, a device worn on a worker’s belt, while at the New York job site. According to Bob Kreuzer, vice president of construction risk control for Travelers, following the development of the Early Severity Predictor and ZoneCheck, the insurer wanted to assist its construction clients in improving outcomes and employee safety. “We are constantly game planning against ourselves around how can we leverage different technologies out in the marketplace to connect them with our customers and help them, whether it’s understanding their risks better or helping them improve loss outcomes,” said Kreuzer. He said the insurer looked at several technology options before settling on the Triax Spot-r. Travelers long standing relationship with Gilbane and the construction firm’s interest in using the product aided in making the partnership happen. The IoT device offers the potential for quicker response to potential injuries by automatically detecting worker falls and providing supervisors with real-time notification of the worker’s location, along with other details. A push button alert gives workers the ability to send their names and locations to the safety supervisor on site. Triax Spot-R. Photo credit. Gilbane. Worn as a belt clip, the technology contains a gyroscope and an accelerometer to measure impact and orientation of the device. “It can tell you did the person roll over after they fell, did they spring back up right away, did they start walking immediately after fall, that type of information,” Schermerhorn explained. In addition, after an event, it can provide details on all coworkers that were near the injured worker, as well as the temperature and humidity. Valuable information that can be difficult to gather when doing an accident investigation or dealing with a claim, said Schermerhorn. “It can be very helpful from a loss standpoint in terms of trying to piece together what happened,” he said. Because there is no access to Wi-Fi on a new job site, a mesh network is created so that wearables and tags connect as soon as a worker arrives. The mesh network is continually updated as construction is completed. Another valuable aspect of the data are the worker profiles that outline their role on the jobsite. The clip is rugged, said Schermerhorn. It has a six-month battery life between charges and no on/off switch. Another data option is an evacuation tag that allows a supervisor to alert all workers via high decibel alarm if there is an emergency on the job site. An optional equipment tag, known as a Spot-r EquipTag, offers the location of every forklift, excavator and any other equipment on the jobsite. It can also provide information on who is operating a piece of machinery. Schermerhorn added that permissions can be set to identify who can operate certain types of equipment. An alert will be sent to a supervisor if an unauthorized user is identified. Equipment certification information can be uploaded as well. Another key aspect of the data collected is the ability to review a construction site history to evaluate claims reported after a project has been completed. Photo credit: Gilbane construction site. There’s no shortage of data tracking options, Kreuzer said, adding that it’s important to identify the problem that needs to be solved before shopping for technology. “If you go the other way, just pick a technology without a problem, it could be like this never-ending test that might not produce anything,” Kreuzer said. Another issue involves resources, he said. There must be dedicated staff to monitor the roll out, determine the data that’s collected and how it will be protected. “You might not accomplish what you set out to if you don’t have a dedicated person or resource pushing it along,” Kreuzer said. Technology isn’t a silver bullet, he added. The testing phase on the technology began in 2017, said Schermerhorn, and it’s being used on job sites across the country. This construction project is expected to last about 20 months.